WoW transmog outfits and where to get them. I acquired my Elegant Robes for about 30g - incredibly lucky. With enough patience and diligence, however, you can acquire any BoE green on the cheap on the AH. But that patience and diligence just might have to last upwards of six months. 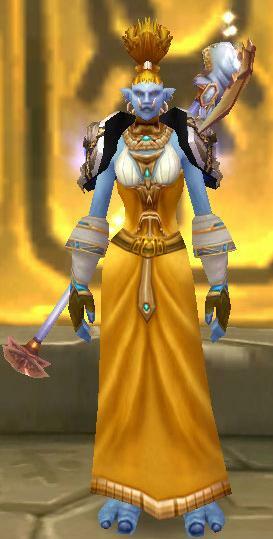 I chose some priestly adornments, though none of them are locked to the priest class. The shoulders, gloves and staff are from Black Temple. It's an easy run through with 4-5 people. It's doable with 2-3 if you classes have interrupting capabilities. Luckily trolls have a matching hair color for these robes. Not wanting my blue skin to clash too harshly, I chose gloves that brought in the skin and even the jewels on the robe. Many Horde races would be familiar with the issues skin colors can cause in making a nice outfit - and I imagine Draenei and Worgen as well. It is something that should always be in the back of your mind when making a nice outfit.